Eddie Hitler-alike Paul Nuttall has gone on the offensive after people have questioned his claim to have been a survivor of the Hillsborough disaster. He claims to have been present at the disaster which killed 96 football fans, along with his father and two uncles. The Hillsborough Families Support Group have asked the perfectly reasonable question why, if this was the case, he has never offered them his support. And others who were there, have said that they simply don’t remember him ever being there. So what’s Eddie’s response? He has claimed he doesn’t like talking about it, and called anybody who questioned the fact that he was there ‘scum of the earth’. Now it’s possible that he was there, but that the trauma of the event robbed others of the memory of his presence. Just as the many of the survivors of genuinely traumatic events don’t like talking about their experiences. But it seems much more likely that Nuttall is fibbing, to use highly unparliamentary language. After all, it wouldn’t be the first time the Kippers have lied, and it probably won’t be the last. Their lying is now so pernicious that one gentleman from Stoke, interviewed by Chunky Mark on a video that was reblogged by Mike, described Nuttall’s office as ‘a lie shop’. The silhouette fight on the end credits of Bottom. Don’t you wish this was Farage and Nuttall? Mike over at Vox Political has posted this story about pranksters sabotaging an event by Paul ‘Eddie Hitler’ Nuttall in Stoke on Trent. UKIP advertised the event on-line, so that ‘lefties’ ordered plenty of reserve tickets without any intention of picking them up. Result: the hall was only half full. Mike observes that he doesn’t condone the use of sabotage by members of political parties against their rivals. But he thinks that unused tickets that aren’t collected may be sold later. In which case, the half-empty audience may give a real picture of what the good people of Stoke on Trent think of Eddie Hitler and his storm-troopers. Bottom’s Eddie Hitler and Paul Nuttall. The likeness is frightening. Over the past week, Mike’s run some brilliant articles about the people of Stoke on Trent expressing their displeasure at Paul Nuttall’s attempt to be elected their MP. I’ve said before that Nuttall looks like Ade Edmondson’s character from the BBC comedy series, Bottom, the stupid, coarse and violent Eddie Hitler. Bottom, however, was intended to be deliberately funny, while there is nothing remotely comic about the racism, misogyny, homophobia and bigotry Nuttall and his party represent. Nuttall’s own attitude to the town and its people is derisory. He has never lived there, and cynically took up residence only a couple of days after he filed his candidacy. The contempt with which he treats them is reciprocated, and the good burghers are fighting back. And the ladies of Women Against UKIP put up a mock Blue Plaque in Nuttall’s honour. This reads, ‘Paul Nuttall, leader of UKIP 2016- Did not live here’. Today Mike’s put up another piece showing a video from Chunky Mark, the artist taxi driver, in which he talks to three people from Stoke on Trent, who give their views on Nuttall and his office in the town. It’s a man and two women. The man makes the acute observation that Nuttall’s office used to be a pie shop, ‘Now it’s a lie shop.’ He states that Nuttall’s party is about causing division, not about helping the people of Stoke on Trent. Nuttall and his party wish to privatise the NHS and schools, abolish maternity and other welfare benefits, on which plenty of people in Stoke rely. And now after making it clear that he wants to privatise the NHS, he now claims to want to save the NHS. The two women share the man’s views on Nuttall. They also makes the point that he doesn’t really want to work for the people of Stoke on Trent, and is just spreading hatred and racism. One of the women reminds the viewers that Nuttall did say he wanted to privatise the NHS, because we have an aging population. She emphasises this, to show Nuttalls contempt for this most precious of British institutions and Britain’s seniors. She also objects to Nuttall claiming that immigrants are coming to take our benefits. She finds this hurtful to the people of her town, and to the immigrants, who come here and work hard and do not take benefits. And now Nuttall’s pasted his lies up. She states that she is ashamed of the shop, and afraid that his lies will infect the local people. As for Nuttall demanding a ‘quick Brexit’, she states that Britain has voted for Brexit, and it’s going to happen. But we need the best deal, and a quick Brexit is not the answer. All of this is exactly true. I think the NHS Action Party has a video up showing Nuttall saying quite clearly that he wants to privatise the NHS. And his statement that immigrants are coming here to steal our benefits is another lie. Mike and the other bloggers have posted up the stats plenty of times showing that immigrants to Britain are net contributors to the welfare state. But it’s convenient propaganda to work people up against foreigners, along with the lie that they’re stealing our jobs. What comes across from this video and the other pics Mike’s put up is that the people of Stoke are ordinary and decent, and extremely and rightly worried that Nuttall and his stormtroopers will whip up racial tension and hatred. Their anti-welfare policies will cause more poverty. The Kippers are doing this purely for their own national political ambitions, without any regard for the local people their divisive policies will hurt. And I’ve no doubt that this could be applied to other towns up and down the country where the Kippers are standing. This is another video from the alternative, left-wing or progressive American news media. This time it’s David Pakman, who’s interviewing Wendell Potter. Potter is a former VP of Corporate Communications at Cigna, and the author of the books Deadly Spin and Obamacare: What’s In It for Me. In his books and other writings, Potter examined the reality behind the comments and the negative depiction of Britain’s NHS in America to show the truth: Britain’s health service is excellent, and far and away much better than that of America. He states that the stories of long waiting times and poor care trotted out by advocates of private healthcare are anecdotal. He also spoke to Brits living in America, and Americans with dual citizenship with Britain, who had experience of both British and American healthcare. He states that they all stated that British health care was better. It was much cheaper, for a start. American healthcare is much more expensive than those in the other countries. Thirty per cent of American costs are wasted in bureaucracy. It is also not true that the tax burden in Britain and other countries with similar systems is higher than America. Americans are also paying significantly for the healthcare in taxes at a comparable level, but this is hidden. He notes that in the statistics compiled of 11 countries in the developed world by international authorities, Britain’s NHS is no.1, while America is right at the bottom at 11. British health outcomes are better, as indeed are those in the other countries, which have state regulated or single payer healthcare. The infant mortality rates in America is much higher, for example. Mr Potter also points out that because healthcare is immensely profitable, the insurance companies and medical industries are actively promoting their system as the best, which he attempted to expose in his book, Deadly Spin. Pakman and Potter also discuss the fact that American healthcare 100 years ago was moving towards something like state healthcare. However, as this became massively unpopular and there was a campaign against because it was the system used by the Germans, who were the first country to have a state healthcare system. This is an important corrective to some of the lies told about the NHS by the Republicans in America and the Tories and Kipper over here. The Conservatives and their Lib Dem enablers are actively privatising the health service. 92 Tory and Lib Dem MPs have connections to private healthcare companies seeking to profit from its dismantlement. A few years ago Boris Johnson even wrote a piece in the Spectator demanding that Britain’s NHS be abolished in favour of the American model. Nigel Farage and his chief gauleiter, Paul Nuttall, have both advocated its privatisation, as have other Kippers. This must not be allowed. andtThis video shows the reality behind the Right-wing propaganda. Mike over Vox Political has written this piece, Backroom deal between Tories and UKIP could kill the NHS on the possibility that Cameron’s lacklustre performance at the Leaders’ Debates may indicate that he is already set on supporting his government by forming a coalition with the Kippers. Many of the Kipper candidates are ex-Tories, and there is a fluidity of movement between the two parties. And together, they are a real threat to the NHS. 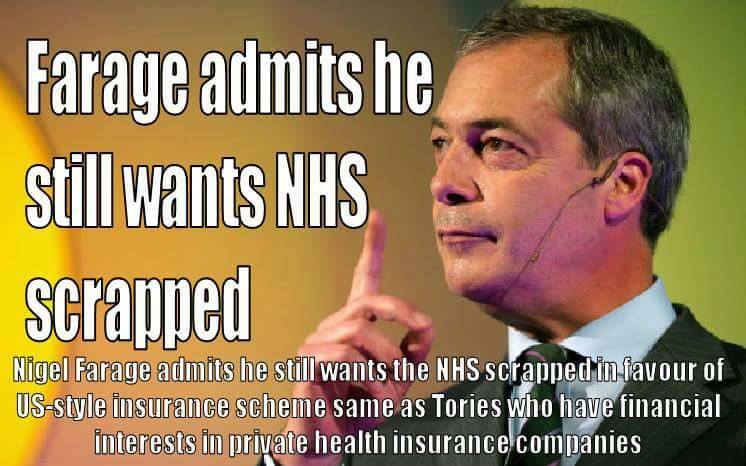 Cameron and his cronies are privatising it by the backdoor, and a series of Kippers, from the Purple Duce himself, Nigel Farage, his deputy, Paul Nuttall, and many others, have stated very clearly that they want the NHS scrapped and replaced with private medicine, funded by private insurance, as in America. This prospect has alarmed Labour’s Andy Burnham, that he has written to the PM outlining his fears. Considering the facts of the Coalition deal with the Liberal Democrats*, perhaps we should be asking if a deal has already been struck between the Conservative Party and UKIP. It would explain why David Cameron’s performance in yesterday’s leader debate was so lacklustre – maybe he doesn’t think he needs to sell himself. A deal with UKIP makes perfect sense to those of us who have watched politics carefully over the last few years – the ease with which Douglas Carswell and Mark Reckless transferred from one party to the other, keeping their Parliamentary seats in the process, shows how interchangeable the two parties really are. Labour’s Andy Burnham has written to Cameron, calling on him to “come clean” about any such plans. He wrote: “During last night’s debate you proved that you cannot defend your record, which is why you cannot win a majority. It is now clear that you are preparing to do a deal with UKIP. “As someone who follows rather than leads their party, you will know that a deal with UKIP is what the Tory Party wants. A growing number of your MPs and up to half of Conservative activists are arguing for it. Local Tory parties are already striking deals with UKIP up and down the country and, of course, two of your MPs have already crossed the floor. “We know the terms of such a deal. Nigel Farage has said he would work with you in exchange for ‘a full and fair referendum to be held in 2015′. You have said you would be ‘delighted’ to offer this. “But the real terms of a deal would see the end of the NHS as we know it. According to EDL News, Oberleutnantsturmgangkipperfuhrer Paul Nuttall told hecklers at a meeting in Porthmadog that they should speak English at UKIP meetings. The two hecklers, including language campaigner Dr Simon Brooks, were angry that there were no translation facilities, literature in Welsh or opportunities to ask questions in Welsh at the meeting. Brooks stated that as most people in the town spoke Welsh, it was a disgrace not to have information and material available in Welsh. Nuttall replied that most people in Wales spoke English. ‘If people want to come here, they should speak English’. There are certainly parts of the principality where they speak English, and in which the people themselves see no need to provide material in Welsh. However, there are also areas which are extremely proud of their language and do make the point of speaking it. And usually at meetings like this, even if one is not able to speak the local language, an attempt to say a few words goes a long way. For example, yesterday’s edition of Bargain Hunt, the popular BBC antiques programme, also came from the Land of Comrades, and the contestants were Welsh-speaking. So the host got them to teach her the phrase for ‘Welcome to Wales’. And there were odd moments when the contestants spoke Welsh to some of the traders in an attempt to get the price down. It was all good natured, and added a piece of local variety to the programme. Nuttall’s comments, and the lack of any gesture in the direction of providing Welsh-speaking material in a Welsh-speaking area will be seen as yet more evidence of Mr Jonathan Stanley complained about the Scots party: that it used the language of English nationalism. And in Wales, as in Scotland, that’s guaranteed to lose votes.